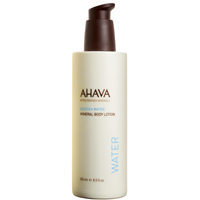 AHAVA Body Lotion is formulated with both Dead Sea minerals and Dead Sea water. The lotion contains UV sunscreens (SPF4) in a delicate, quickly-absorbed, nourishing formula. Leaves your skin silky smooth. Great after sunbathing, shower, or bath.